Can you clone items and/or Pokemon before you beat the Elite Four, or is that only available afterwards? Since the Battle Frontier is only available after the Elite Four, I would assume so. However, you might be able to clone in one of the small Battle Tents around the Hoenn Region, which are available before the Elite Four. I'm not really sure. No, you can't, because there is a glitch in the battle tower so that when you follow the directions available (maybe on this site? I don't see why not. ), the game saves the pokemon in your party, but not in your pc. That glitch doesn't occur anywhere else in the game. this is completely a random event that can happen anyday. but some people have been saying that its more frequent when you beat the elite four. There won't be any department store sales until after you beat the elite four, and then they don't happen very often. Say I'm fighting a trainer, and they send out a pokemon. Is there a link between how many experience points I'll get from making the pokemon faint and the experience curve that the pokemon that fainted has? 1,25 million tough etc. etc. The only things that do affect how much exp your pokemon will earn (that are determined by the enemy pokemon ie. not taking into account your boosts) are the enemy experience stat or base stat (which can be found on the stats page on the psydex), the enemy's level, and whether the enemy pokemon is trained or wild. I've looked all through the site for this, and I can't find it. I know wild chinchou can hold yellow shards and wild corsola can hold red shards. But what wild pokemon can hold blue and green shards? clamperl hold blue shards and relincanth hold green shards. I don't seem to be searching hard enough. Thanks again. The site shows the maximum attack of Groudon at Lv. 100, but can someone tell me the maximum attack of a wild Groudon at Lvs. 45 & 70? Well there you have all the possible attack stats for Groudon at level 45 and Groudon at level 70. I just copied the format used for the stats page for pokemon on ther psydex (which is where I assume you first looked). Well that's how I understand it. Can someone please help me I'm so stuck. How do I learn Waterfall? Is the Cave of Origin the place where team magma put the submarine? And where in the world are they? And, last question, Am I supposed to go to Sootoplois city first or the Ever something the one with the waterfall? I'd be really grateful to someone if they helped me! THIS IS IN RUBY VERSION BY THE WAY! To learn Waterfall, you need a HM (HM Waterfall, obviously). This HM is obtained at Mossdeep city, after beating the twin gym leaders (Liza and Tate). Cave of Origin is where you capture Groudon (you said you play Ruby version, so that's what's in there). I can't exactly remember where Team Magnma is, but where are you in the game? You go to Sootopolis to beat the Leader, then you exit and head off to Ever Grande City to use Waterfall, get up the waterfall, and into Victory Road. From there on, you go through the maze and into the League. 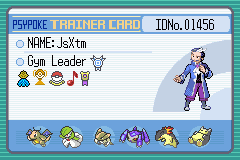 Defeat the Elite 4 and the Champion, and the storyline is done (not completely, but the main part is done). The question that Hyperbole didn't answer for you, I shall answer. Magma put the submarine down in the Seafloor Cavern, underwater on route 128. Since route 127 connects to 128, it's advised you dive there to avoid all the trainers. From there, work your way south until you see a cave. That cave should have the submarine. When you see the submarine, resurface there (don't exit the cave). Both of you helped me I got to Sootopolis city and the seafloor cavern I just gotta find Maxie and beat him it shouldn't be that hard. Thanks Hyperbole and DNA! You both were a big help! Mossdeep is the island in Northeast Hoenn with the space center. Are you confusing it with Pacifidlog, the really tiny island in the south that has the current to the west? No problem, Millie; I'm here to help. I looked at the stat calculator on the site, and the maximum Special Attack stat for a Lv. 70 is 259, but for it to have 259, the IV/DV (whatever it's called here) for the stat could either be 30 or 31. I wanted to train it so that it has 438 Sp. Atk (the most it can have) when it gets to Lv. 100. If the IV/DV for said stat is 30, will have 437 at said Lv., but it's stats at Lv. 70 won't be affected. How can I know whether the IV/DV is 30, or 31? You can Rare Candy it up, then reset the game. But a difference of 1 point is very little difference, especially for SpA. I checked the stats for a level 70 rayquaza (doesn't matter what nature) for every DV and there is pretty much a different stat for every DV at this point. So when you catch the rayquaza, put its nature and stat into the DV calculator an you will 1DV and occasionally 2. How do you make your pokemon happy enough to level up? I'm trying to make my Golbat evolve into a Crobat but it doesn't seem to be working. Sorry if this is a really obvious question because it seems like it would be. I keep my head on tight I make my plans at night and I don't sleep, I don't sleep, I don't sleep til it's light! Do you have the national dex? I don't think you can evolve a Golbat into a Crobat without it (you get it by beating the elite 4 in Emerald, you don't need it in RS, and if you need it, Golbat will start to evolve and then stop). Otherwise, look at the Happiness guide, it has everything you need to know. I just restarted my Emerald any suggestions so that I don't screw it up too badly? I already chose my starter (Mudkip). well, I'm not quite sure how you could screw things up as you can always rebreed, remove EVs, etc. The main thing is that if you want good natured legends, make sure you reset to get those. So giving it pokeblocks only effects stuff like contests not their happiness? That's right, pokeblocks don't affect happiness. Only walking, giving pokemon vitamins, using pokemon in important battles, and levelling up raises happiness. 1. How can I get a black belt? The location basedfrom theitemslist is Route 115 but I could not find it. 2. Are there Pokemon that cannot have certain nature? I am breeding my ralts so that I will have ralts with synchronize and all the natures. I will use them so that I will find good-natured pokemon. I've read that the second effect of synchronize ability is that the encounter rate of Pokemon with the same nature with the pokemon with synch is increased if it is placed first in the team. It's working. But I still don't have ralts with adamant nature. I've been breeding for hours now. If you would say that I should catch ditto with the desired nature for easy breeding, that cave is still not open. 3. If I will not let my pokemon evolve so that it will learn certain move (ex. shroomish - spore) and I let it evolve after learning that move, will it be able to learn the missed moves (ex. breloom - mach punch)? 4. Will 2 dittos lay an egg? 5. What is a bad egg? How will you get it? I've seen a thread entitled Bad Egg. 6. Where can I buy rare candies? I want to use them to check the DV's of the Pokemon. 7. How will I get my own Trainer ID? 1. Not sure; have you checked the hidden area you have to surf to on the upper end of Route 115? 2. Yes, eventually you'll get all the natures; every single nature is possible for every single pokemon. Breeding will take forever, though, I'd prefer catching them. 3. If the evolution would have learned it at a level you're already passed, then it will only learn it if you use the move rememberer to teach it. Otherwise, it'll learn it whenever it gets to the level it learns it at. 5. Bad Eggs are a side-effect of cheating a lot with a Gameshark or Action Replay. They are bad. You do not want one. 6. You can purchase them with BP in the Battle Frontier in Emerald; otherwise, I don't think they're not available anywhere else. 7. Do you mean a Trainer Card like the one in my signature, or one in-game? Edit: My mistake, you're right, Cherrygrove. 6. You can purchase them with BP in the Battle Frontier in Emerald; otherwise, I don't think they're available anywhere else.